Water-retaining dams form a vital part of New Zealand’s critical infrastructure, providing electricity, potable water and irrigation resources to a large proportion of the country. The damage or failure of these structures would incur a significant potential financial loss to the country; not only from the physical repair or rebuild cost, but also the potential for extended outages in power generation and/or municipal water services. This paper presents a cross-sectional characterisation of dams in New Zealand, based on the recent compilation and analysis of a New Zealand Inventory of Dams (NZID). 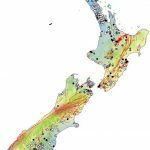 The NZID is the first inventory of its kind for NZ dams, comprising almost 1200 unique structures over 3 m in height. Inventory data was sourced from existing publications, NZSOLD, and regional authorities. The analysis of anonymised inventory data provides an understanding of the number and distribution of assets, along with characteristic physical properties (construction material, height, age, purpose).